State Department doubles down: The Constitution, not Trump, "speaks for the country"
Home National State Department doubles down: The Constitution, not Trump, "speaks for the country"
The State Department is making it very clear to America and the world that Donald Trump does not speak for America. In a stunning rebuke of Donald Trump, Secretary of State Rex Tillerson said on Sunday that while his department speaks on behalf of America, Trump "speaks for himself." "We express America’s values from the State Department," Tillerson told Fox News host Chris Wallace. Trump, on the other hand — whose overt sympathy and support for white supremacists and neo-Nazis who rioted in Charlottesville led to a rare "early warning" from the United Nations Committee on the Elimination of Racial Discrimination — does not speak for America. And just in case that message did not get through the first time, an aide to Tillerson has reaffirmed in an interview with CNN that the president of the United States does not speak for the United States. It is remarkable, if not outright unprecedented, that a member of the president's administration would argue that the president is not a spokesperson for the country he represents. It's also patently absurd and false. 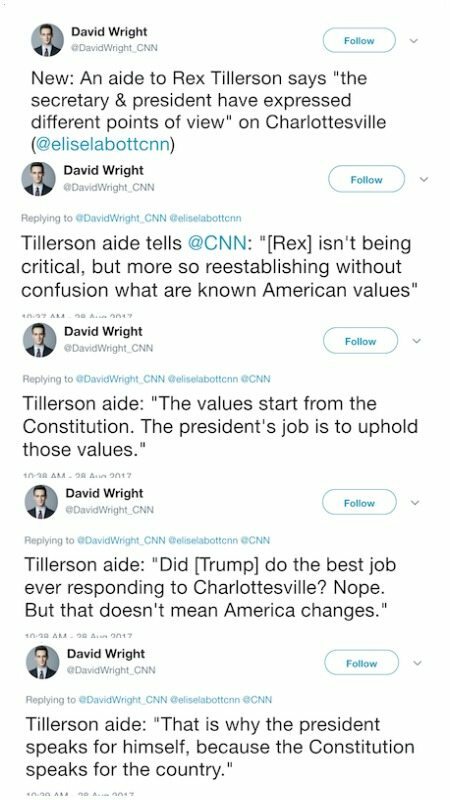 That Tillerson has not only not walked back his remarks, but that one of his aides has expanded on them, shows this is an obvious State Department strategy to attempt to assure the rest of the world that Trump's values are not America's values. If Tillerson and his staff are willing to say such things publicly, one can only imagine what the State Department is quietly telling friends and allies around the globe. This desperate attempt to spin away Trump's atrocious words and actions demonstrates just how badly Trump is already damaging America, at home and abroad. Next articleRick Perry pathetically spins Trump's distracted reaction to hurricane as "multitasking"